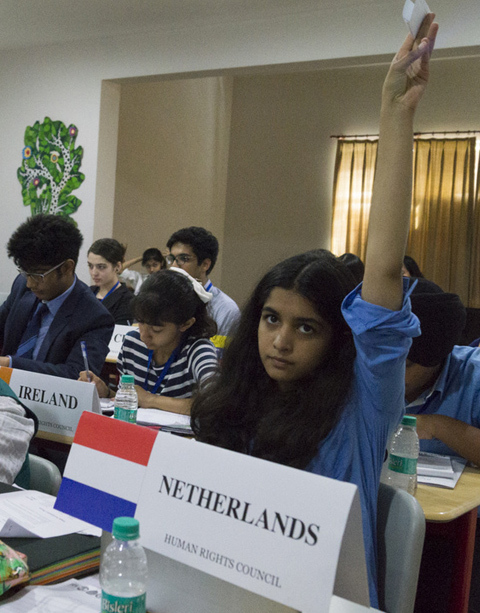 An academic simulation of the United Nations, the MUN aims to educate the scholars about current events, topics in international relations, diplomacy and the UN agenda. Scholars research about a particular country, take on roles as diplomats, investigate international issues, debate, deliberate, consult, and then develop solutions to those problems. During a conference; scholars are required to employ a variety of skills in order to present the Policies of the Country they represent. These skills include communicativeness, critical thinking, public speaking, team work, research, policy analysis, active listening, negotiation, conflict resolution, note taking, and technical writing. A spirited and unforgettable experience for everyone including the Secretariat, the Organizing Committee, the Executive Board members, the school staff, all the delegates & the International Press members. More than 250 delegates from over 20 schools participated in the event that was conducted with vigorous debating supported by in-depth learning, thanks to the Executive Board members. Of these, the TPM was an unconventional committee- a first timer and an innovation of the Genesis MUN Secretariat members that blended football and politics with all four clubs- the Two Manchester greats and the Two London greats – Manchester United, Manchester City, Arsenal, and Chelsea. For the first time in the history of MUNs, constantly updated websites were created for each committee that served as a comprehensive research guide for the delegates. Also, the International Press did a wonderful job with journalists and photographers working hard to capture some of the most crucial parts of the event through their reports and photographs. Everyone who attended , be it delegate, teacher, EB member or guest, left with a sense of accomplishment of having invested their time in something so deeply gratifying.